I must confess that when I saw the first time I didn’t get the concept but now, it’s more clear! 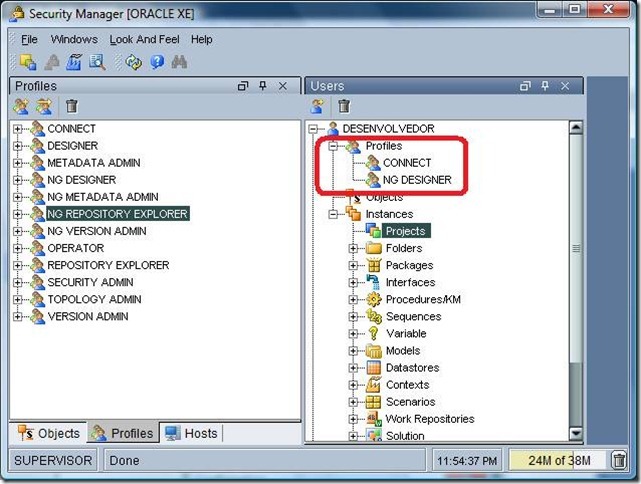 In ODI 10g we had this big issue of killing the job especially its big headache when we need to ping or disturb DBA . 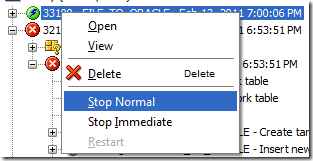 ODI 11g seems to handle this situation smartly by introducing new options called STOP NORMAL and STOP IMMEDIATE. You can find this option under the running session.Lets look how this two options work. A pop up will be shown for Stop Session dialogue and click OK to kill it. After running a few test I have seen that Stop Normal takes time to kill the session and after a while we get the Session Stopped dialogue. 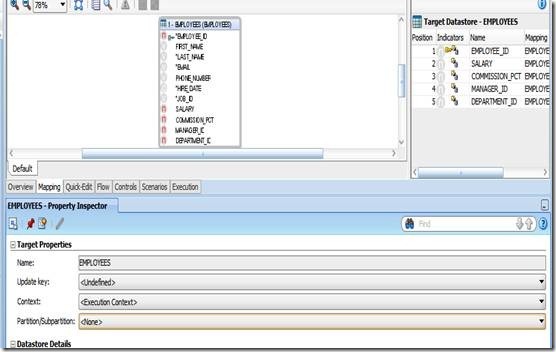 Generally in the Normal kill command, Oracle marks the query with status of Kill so most of the time the Oracle will wait for the operation or query to be processed and mark the query as Killed and pretty much the similar logic is being carried out for the STOP NORMAL, so this kill operation takes time. 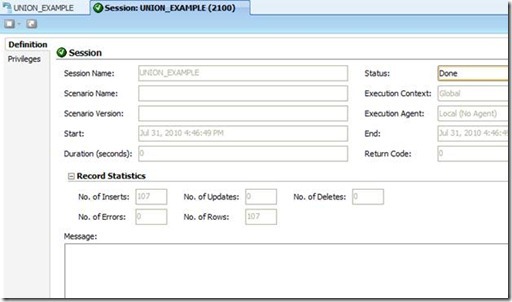 My SID query also return nothing as the Session is killed in the Database too. 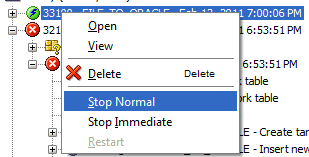 Similar to the Stop Normal the Stop Immediate will ask the permission to be killed or not . Click OK for the confirmation. 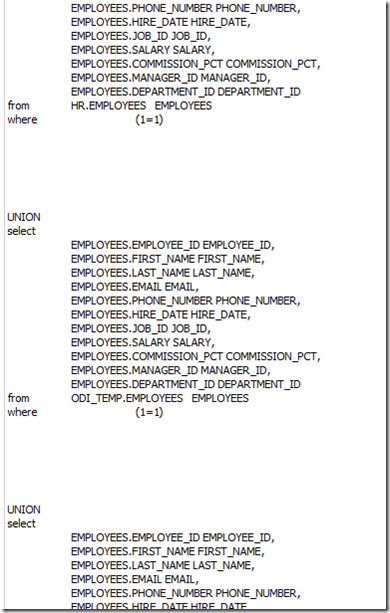 Being an Immediate clause , the query is killed immediately. Note:- This process can only work when the User used in Topology have the necessary Kill permissions. That is it! I hope be useful to all of you! 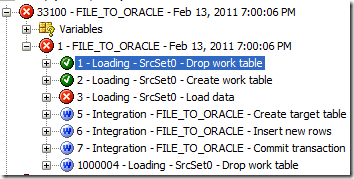 We have seen that in ODI 11g the support for table partition . We wanted to see the ability and support and recognition of it , so we have done some sample run through test and here we are sharing what we have seen . Here we are creating a Partition based table. 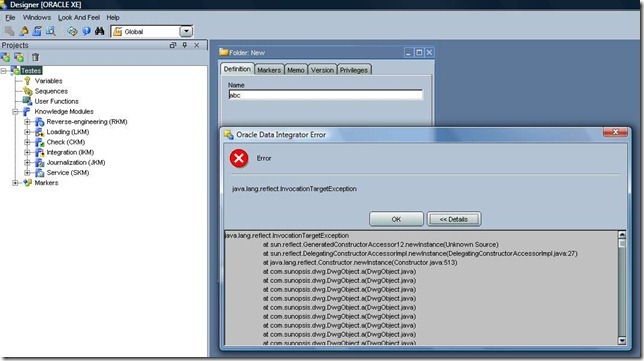 After running the script in database , We have used the selective reverse and have found that it failed to recognizing the partition, so we reran the reverse using the RKM Oracle. 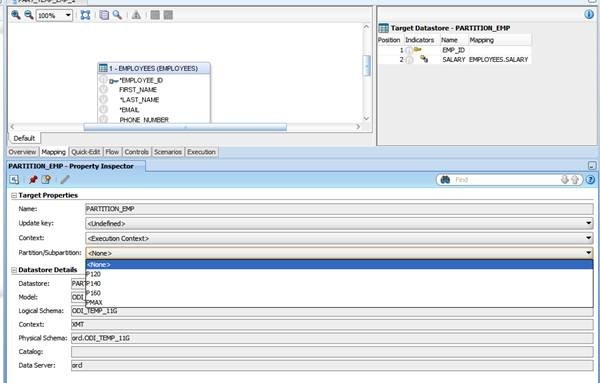 The Oracle RKM successfully recognized and captured the Partition and was able to see in the Datastore also as a standard practice its always great to go for Oracle RKM. 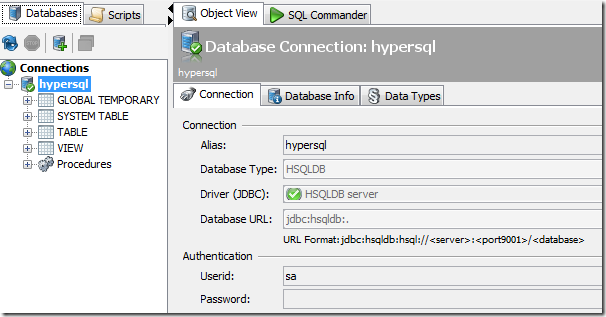 Since database handles the partition allocation, handling the insert was easy task. 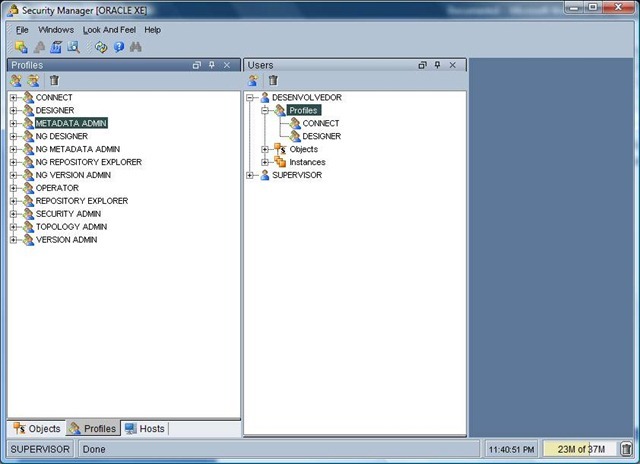 we also wanted to check if the Create table can create a partition based table and we have created database structure with the required partition type and values and used the same into the target. 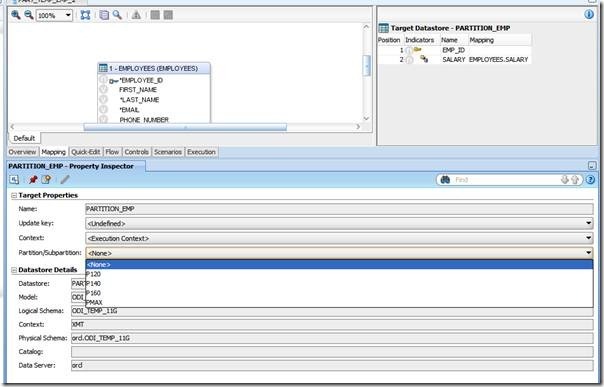 As you can see the Create table was created without Partition, so still the KM don’t have the support to handle the partition and would need to be created via either database or Generate DDL and run the same in the target. Well, as I told at the beginning still needs some improvements but already useful. Thank you for visit us!!!! 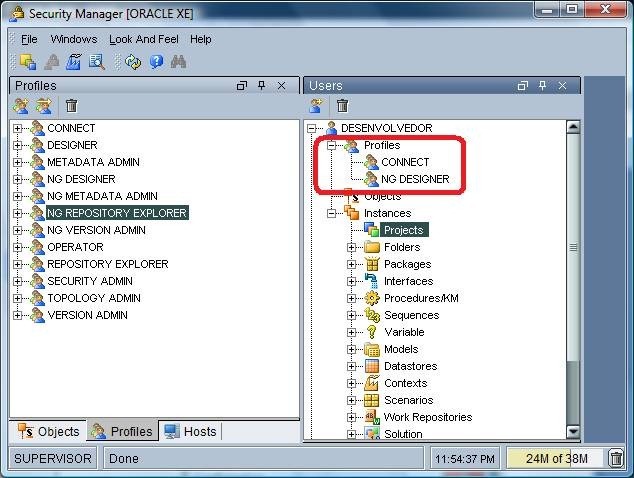 During a recent Oracle forum question i was looking at an interesting question where the user said the ODI Scenarios throws the error ‘ No module names re ‘ . Initially i thought might be the user is making some mistake but then he also wrote ‘the codes are working perfectly in the Designer’. Strange . I thought let me do a faster run in ODI 11g and check if that is really the case and I wrote a small Jython procedure based on ‘re’ module and ran via designer no issue. Now i made the scenario and ran via startscen . 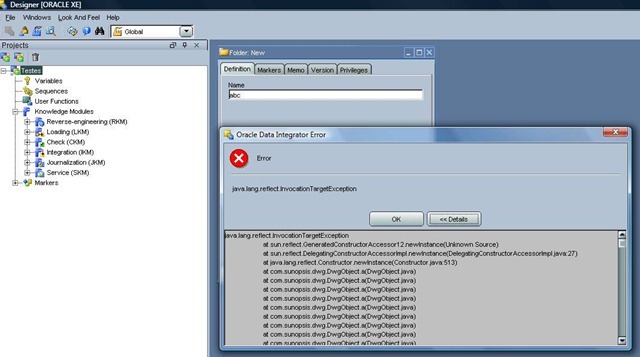 Hmm same error as the user reported. 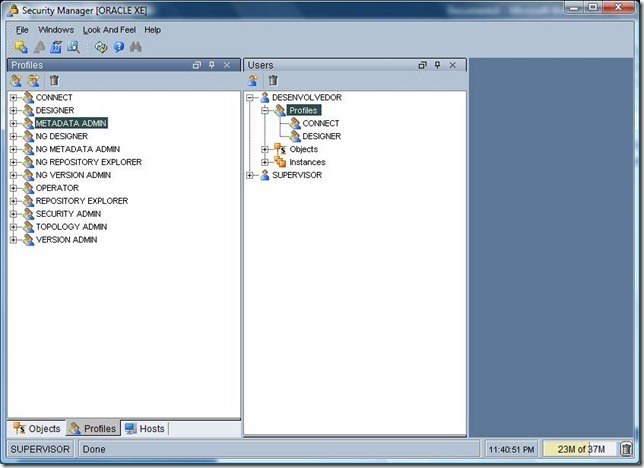 Although i thought of changing the path of odiparams but then it might cause other links broken so copying the Lib folder from Oracle_ODI1oracledi.sdklib to Oracle_ODI1oraclediagentlib is the easiest solution. First I wish to all of you a really Happy New Year! I hope that 2011 can be the best year ever to all of us! Second, sorry, sorry and sorry. We “abandoned” our blog this last few weeks. I got a lot of new responsibilities on my formal job and Dev was in vacation with his family. We are going to try to be more present from now forward. Third (and last) let’s talk about scenarios! 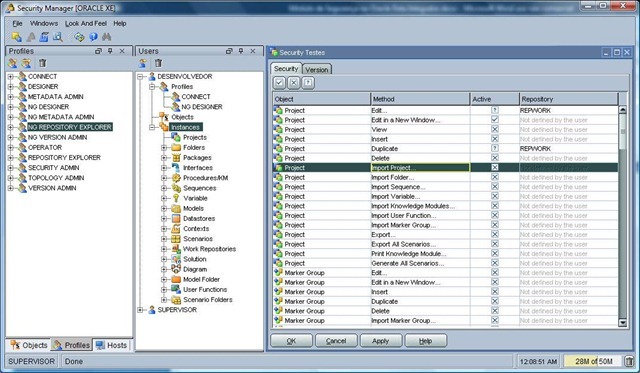 I Oracle Data Integrator, our famous ODI, is very common to develop all objects that you need to your integration and, at end of the development, add all of these at a package, create a scenario and that is it. Test and go to production. That is the common way in all ODI environments that I saw until today… let’s discuss this. When we are developing a it’s normal to have several tables to load in some order (parents, children, etc), procedures to performs some “not interfaceble” task and variables that uses code (refreshing type). Then, all we do is add all of this in a package, generate de scenario and our development is done. OK, now let’s think about it from the Software Development Life Cycle (SDLC) perspective, I mean, everything that is developed will get some maintenance in one of his “pieces” some day. As we change just one piece from all our package, of course we should test just that piece right? NO! And here is the problem! Who can guarantee that none of the others pieces (or ODI objects) was changed? 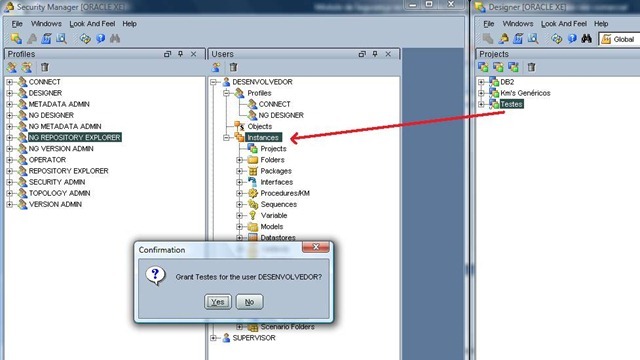 In fact, using a trusted SDLC, you need to execute the complete test plan (the same that allows the first delivery) once all code was “compiled”, I mean, regenerated (in ODI terms). And if we split the development in small pieces of scenarios, as small as possible, even at object level (as we can generate scenarios from objects ) and then create a package (or packages) that orchestrate the execution of this small pieces???? Of course that the first delivery will have a lot of scenarios to be imported at production but when some change is necessary you can update only the relevant code and, too, test only it. In this way your SDLC will get less errors and the cost (HR, Financial, Hardware, etc) of tests will decrease substantially and plus, you can always re-use any of the object scenario. If you pay attention, you will see that we are talking about the old concept of Object Orientation, nothing new. 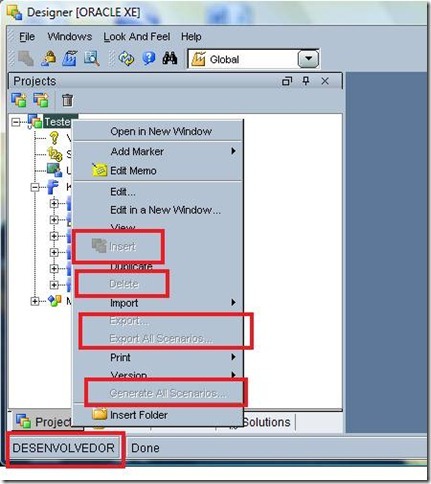 A tip to use this approach is to have the Operator (scenarios tab) organized in folders. This will avoid the endless list of scenarios and brings organization to the environment. Well friends, that’s all for now. I hope you keep traking us! 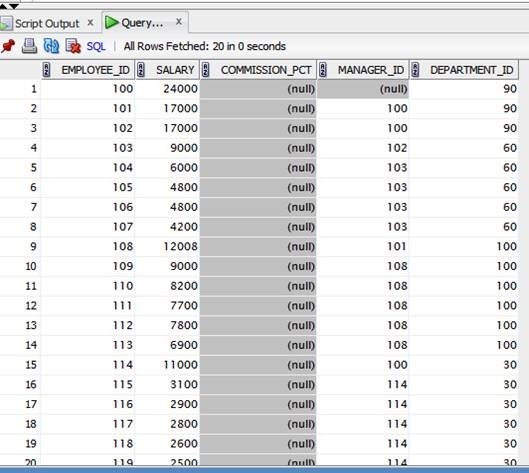 I got this video from Craig Stewart that shows us how to direct load data from source to target with no work (C$ and I$) table use. Simple, fast and very clever! Thank you for share your expertize Craig! As this is a feature that comes from 10g but still present at 11g and pretty useful, we decide to discuss it as “11g part”. You will see that it’s really useful in several situations. We all have seen the Sunopsis Memory Engine but have never used it or played with it. 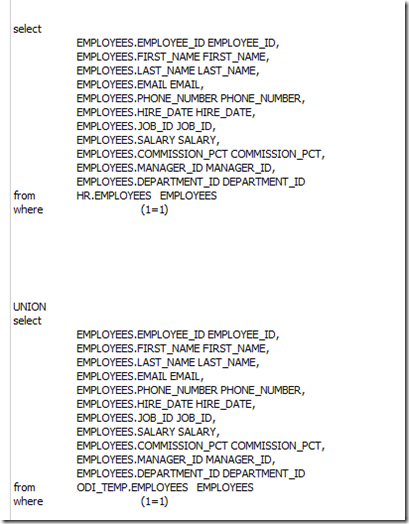 This post is all about it and using it smartly for various activities, without using target RDBMS for temporary activities. 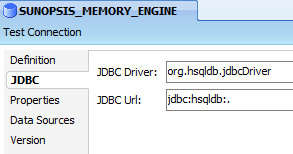 If you are wondering what actually is Sunopsis Memory Engine , its nothing but the HyperSQL , which is an 100% java database. 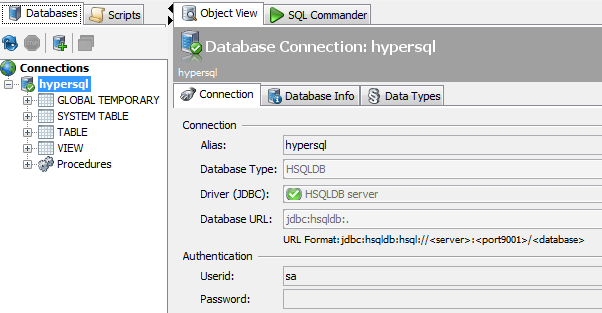 The Demo environment runs on the HyperSQL. we believe that Sunopsis Memory engine can be great for creating temporary table or storing data temporarily for ODI logic implementation. Lets look at various implementation uses and method. Similar to any RDBMS you can call these tables into the Variable too , just select the SCHEMA as SUNOPSIS_MEMORY_ENGINE and write your query. 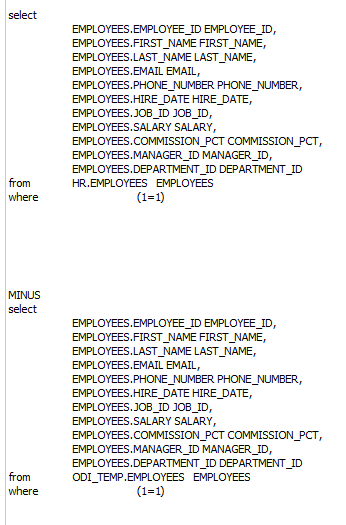 For example select id from temp_table. Similar to Oracle , you can read it via Jython or Java and fetch the required information. 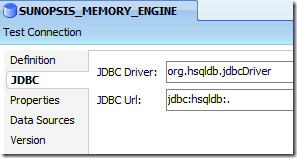 If you ever need to read the data from File via jython or Java and write into Sunopsis Memory. Here are the codes. Some time we would like to store the data into Temporary purpose for testing or debugging purpose. 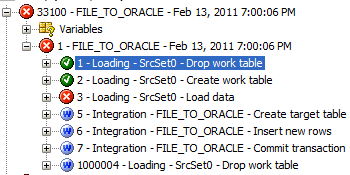 We can also reverse engineer the table using the select reverse too. Now you can use it as you wish!!! 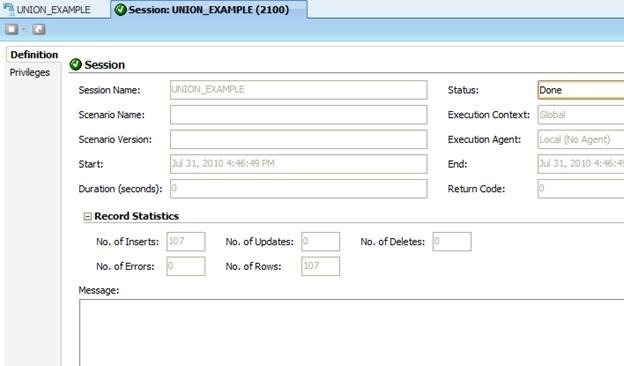 We have shows you few important features of the new ODI 11g ,today we are going to show you how to implement Union , Minus etc logic in ODI 11g which was lacking in older version and thus maturing ODI in the ETL world. 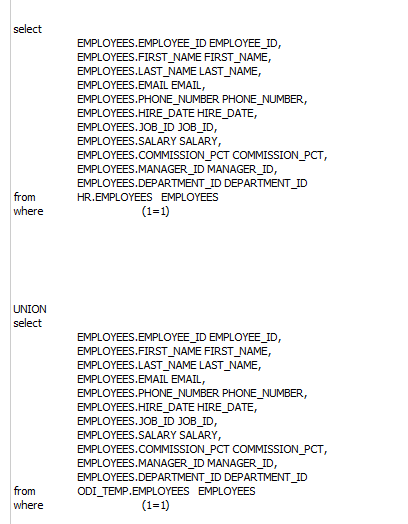 Rename the Dataset Name to Source 1, Source 2 for more meaningful or else you can provide the Table name too and in the Second Dataset name select the Operator as Union. 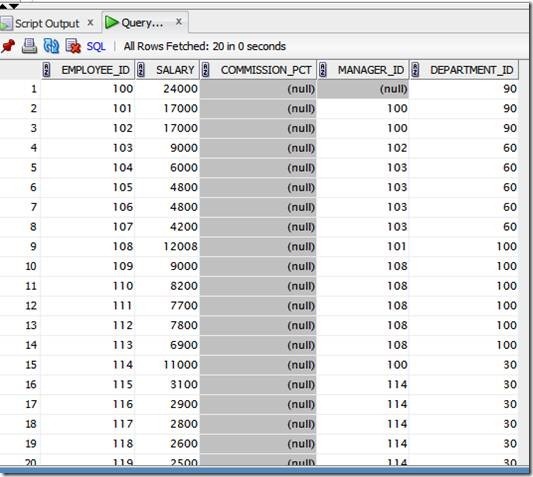 Drag in the Source tables and Target table and map the columns accordingly. 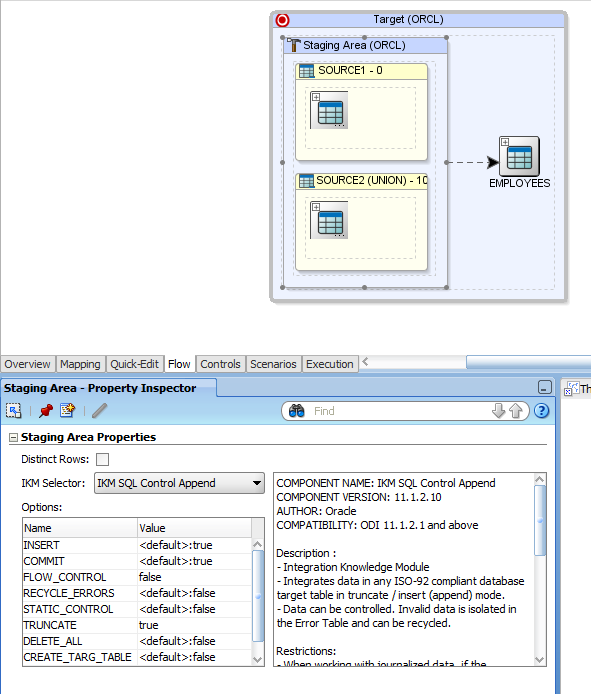 Go the Flow tab and select the Staging Area and select the appropriate LKM and IKM. 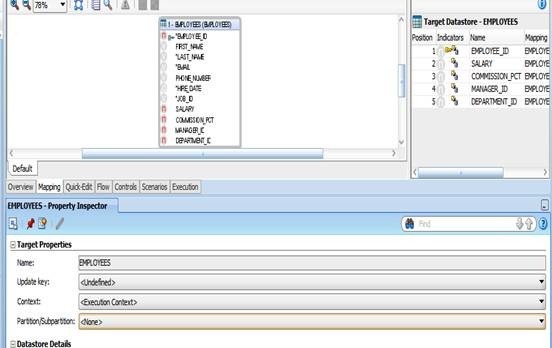 ODI 11g provide a new feature called Simulation as that generates all the required codes without running the Interface , useful functionality when you trying carry some complete logic where you want to test in SQL Developer or Toad because carrying out in ODI . Lets see the codes and as we see it has carried out the required UNION operation between two tables. 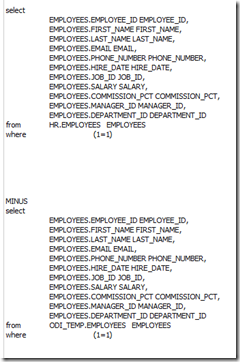 Let’s try the same interface for Minus with truncate table option yes in Target. What if we want to do UNION between three tables? 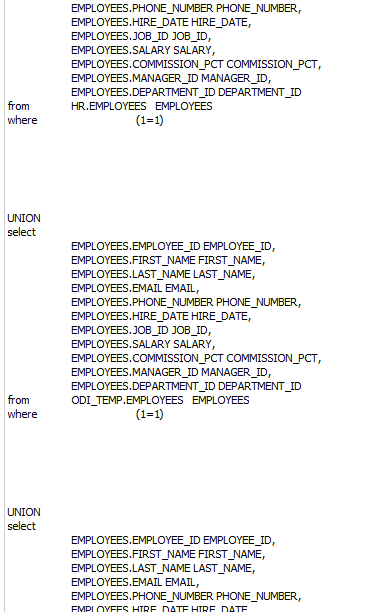 Just select the right operator and the ODI will create the logic as defined. 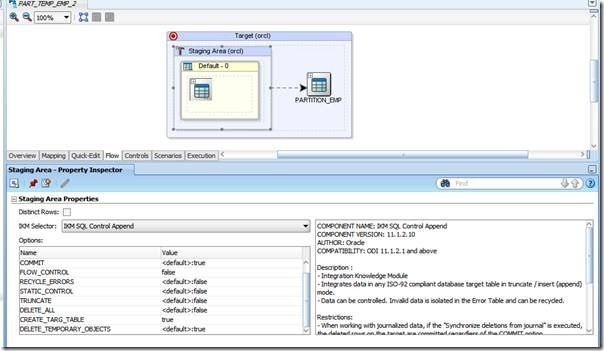 This functionality give an extra edge for ODI on ETL side. 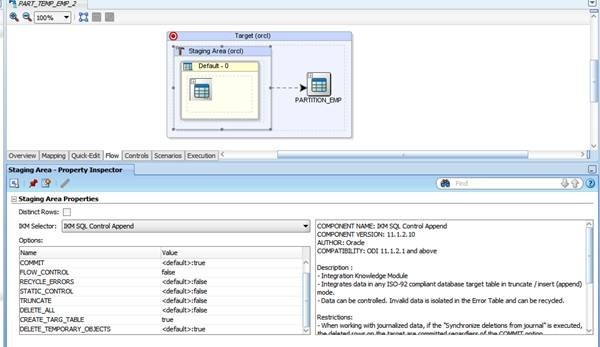 Keep looking odiexperts for more ODI 11g functionalities . We wrote this article to try to send some light on Security Module (10g for now) once several emails asked us for do it. After opening the window only enough to fill the required information. At the end of user creation, you must add this to the desired profiles. 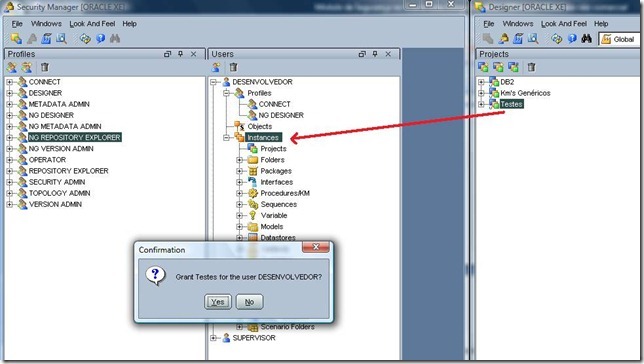 I will use as an example, a developer can access any object in the repository development. 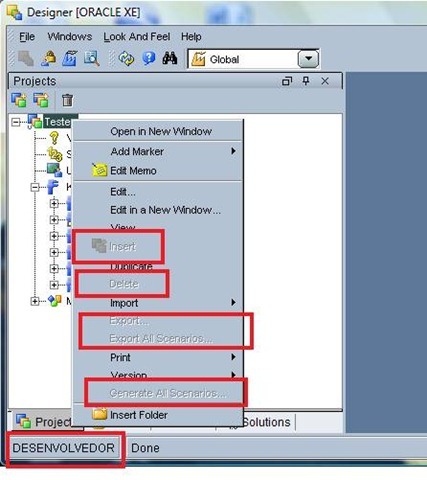 Completed these steps the user is able to connect the repository with rights that were signed. 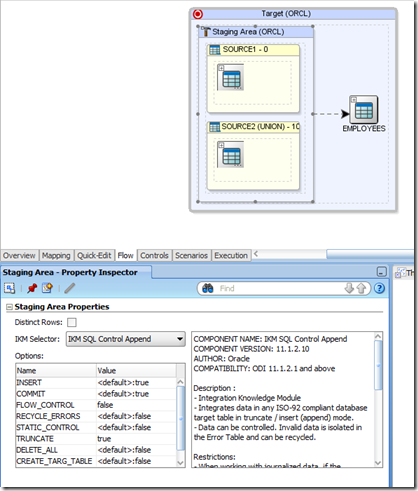 Granting privileges on projects and their components. Granting privileges to a specific project can only be assigned to users have “Supervisor” and also with the profile of the “NG” (not generic). a. The mark “Checked” means that the user can perform that action in any repository. 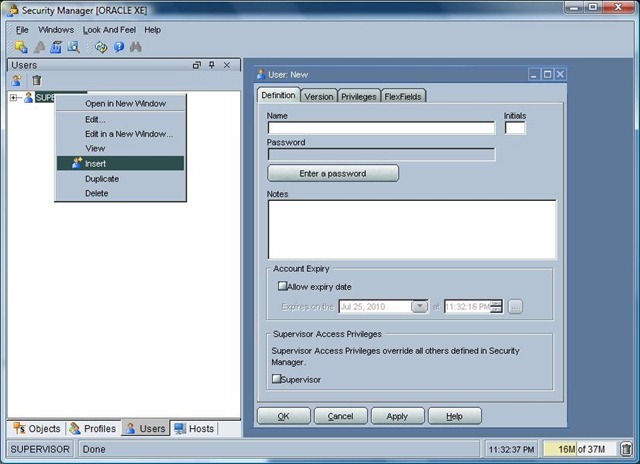 It is interesting to inform you that the “rights” controlled by the security window can be understood as the options that appear when you right click on an object. The configuration of users without the standards should be made at the level of each method on that object. 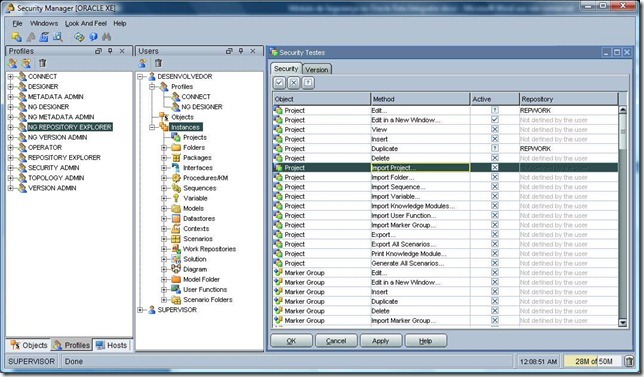 These are the main tasks and concepts on Security Module.